Senso-ji Temple, the oldest temple located in Tokyo, and Nakamise-dori connecting the Kaminarimon entrance to the main hall are constantly crowded with sightseers on a yearly basis. Since the area has always had a large number of temples since the Edo Period, it has been called Teramachi, which translates to ‘City of Temples’. Asakusa Kokusai Avenue is where you can enjoy shopping while walking through this Teramachi. As soon as you exit Asakusa Station, there are many unique stores that sell goods such as Japanese sweets and there is even a taiko drum museum. The area of old streets where people have been residing since the Edo Era is called shitamachi (old downtown), and it is recommended that people take their time to take a look around at the history of the Asakusa corner of shitamachi. During the springtime, the nearby Sumida River has cherry blossom trees lined up on both sides of the riverbank for a kilometer and when in full bloom, it is a great place to be for hanami. In Asakusa, you are able to enjoy the cherry blossoms, shitamachi and Tokyo Skytree. Tokyo Skytree, soaring above the old town of Asakusa with its temples, wooden residences, rickshaws and venerable dining establishments such as Imahan (sukiyaki) and Daikokuya (tempura) contributing to its shitamachi atmosphere, is a popular photo op location for many sightseers. In 2012, the Tokyo Skytree took on the role that Tokyo Tower had as the main radio tower and as a commercial facility, and in recent times, has become a new landmark of Tokyo. The tower has become popular as a sightseeing stop for Japanese and foreign visitors alike. The recently established commercial center called Solamachi, located directly next to Skytree, has everything from shopping to food for the young people of today concentrated under one roof and it is an ideal place to take a rest after exploring Asakusa. When people think of Asakusa, they also think immediately of Kaminarimon. These are the outermost gates of Tokyo’s oldest temple, Senso-ji. The large red lantern located directly in front of these gates is one of the most photographed places in Asakusa. The path approaching the shrine that is located between the Kaminarimon and Senso-ji’s main hall is known as Nakamise-dori and has many shops along it which sell a wide array of souvenirs and goods, such as sweets called Kaminari-okoshi made of rice or traditional Japanese sweets called “ningyo-yaki” with red-bean paste in between bite-sized sponge cakes. You can stroll and eat from many of these stores, so it is highly recommended to try as many unique delicacies as possible. The other goods sold range from sword replicas to Japanese fashion items, and it is likely that you will find souvenirs to your liking to take back home. Lined up outside of the temple are rickshaws whose drivers can carry and transport you throughout the area. During the Meiji and Taisho eras, as well as the initial stages of the Showa period, these rickshaws were very commonly used. These rickshaw drivers can not only take you around Asakusa, but they can also provide you with explanations and stories about the area as you ride around. This is recommended for those who want to tour Asakusa within a short amount of time. Although there are many festivals throughout the year in Asakusa, the most famous of them is the Sanja Festival in May. The entire district of Asakusa comes alive during the festival, and the area shrines and Nakamise-dori are some of the areas used for the festival. The festival continues on for 3 days and over 150,000 turn up to the festival. This festival is truly a seasonal tradition of the early days of summer. During the Edo period, Sensoji Temple was used as the main temple of prayer for the Tokugawa shogunate and resultantly, Sensoji Temple flourished in the city of Edo. Asakusa as a whole is representative of this shitamachi (downtown-style) culture during the Edo Period, and Sensoji Temple is the sightseeing spot that represents this history and culture of Asakusa largely due to the number of visitors it receives on a yearly basis. There are over a staggering 30 million worshippers whom visit the temple yearly and of this total, many are visitors from abroad. The main outer gate of Sensoji Temple, Kaminarimon, is the most famous landmark for this attraction and the large lantern connected to this gate is the top ranking photo opportunity location for visitors to the temple. This sizable lantern is 4 meters in height and weighs a whopping 640 kilograms. To the left and right hand side of the gate are images of the wind god and thunder gods. Derived from these images, the gate formerly was called the wind-thunder gate but eventually was abbreviated to the shorter thunder gate. The temple was destroyed in the great fire in the first year of the Keiou era (1865- 1868) but in 1955, the world-famous company Panasonic donated funds to rebuild this landmark of Asakusa. After entering from the outer gate, there is a street heading to the main temple called Nakamise-dori lined with stores that sell various traditional local foods and merchandise. The local specialties of Aasakusa that you can find here are ningyo yaki, which are bean jam cakes formed in the shape of dolls, as well as sweet rice snacks. Since there are many options to try local specialties on this street, you should certainly attempt to sample a few different foods. As you proceed further down this street, you will eventually approach Hozomon gate which has been preserved as an Important Cultural Property. Also, you will encounter the main temple and the surrounding 5-story pagoda as well as Asakusa Shrine. The architecture of this five-story pagoda can withstand the intense pressures of the earthquake-ridden Japan and accordingly, the newly constructed Skytree has been constructed with the architecture of the five-story pagoda in mind. From Senosoji Temple, it is possible to also catch sight of the Skytree and compare the similarities and differences between the two towers. With scenery where you can enjoy the collaboration of Senso-ji Temple, Nakamise Dori, and Tokyo Sky Tree with the historic streets, Asakusa still retains the appearance of Japan from the good ol’ days. It is known as a must-see tourist spot and Asakusa Hanayashiki is also one of those atmospheric tourist areas where you can feel the nostalgia. First opened in 1853, it is Japan’s oldest amusement park, and the roller coaster that was popular back in the day still survives today. The 60-year-old roller coaster only has a speed of 42 km/h, but it is still popular as one of the most famous attractions at Hanayashiki. Also, there is plenty to satisfy the ride fans with rides such as the Space Shot with its 60m-high drop and the Disk O with its exhilarating centrifugal force. 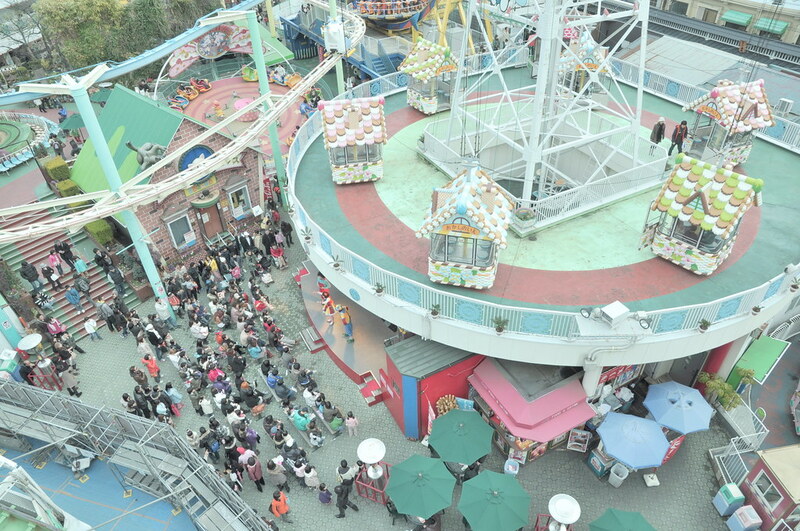 There are also attractions without height restrictions such as a merry-go-round and a mini-Ferris Wheel so that families with small children can also enjoy the park without worry. Furthermore, the Bee Tower is also recommended. Known as a symbol of Hanayashiki, it is a ride whose house-shaped gondola moves slowly at 45 meters above the ground. From inside the gondola, you can get a full view of the Asakusa area. At night, the area is illuminated so the evening view is even more exceptional. At Hanayashiki, there are events and interactive venues including Hanayashiki Pro Wrestling, a ninja training ground and stage shows. Information on the occasional pro wrestling and live events can be found on the homepage. Also, there are plenty of other ways to enjoy Hanayashiki outside of the amusement park attractions, such as the Hanayashiki BBQ Garden for which you don’t have to bring any utensils. There are 170 shops spanning a distance of approximately 800 meters which sell anything having to do with cooking. The Western tableware store, Niimi, has a huge model of a cook at the entrance to the street which has become a landmark. The store itself has amassed just about everything that has to do with cooking including Western and Japanese tableware, bar utensils, cookware and bakeware. At Kama-Asa Shoten, which deals in knives and Nambu ironware, there are English explanations for the knives, and there is also a name engraving service for purchasers in which their names are converted into kanji. Nambu ironware kettles have the ability to rid water of any chlorides which brings a mellow quality and therefore makes tea taste better. Iwasaki Be-I, the original store for plastic food samples, has a giant rhinoceros beetle as its logo. The store deals in samples that are specific to Japanese culture. You can also create your own samples (reservations necessary). As it has been for ages, the material is wax. Through very fine temperature control, the wax goes from liquid to solid as it gains its final impressive appearance. Keyholders and straps are popular as souvenirs. The name “Kappabashi” apparently derives from a story about Kappa sprites living in the nearby Sumida River. It was once said that the Kappa were water deities who often saved the commercial area from flooding. In fact, the statue of Kappa Kawataro is the area symbol which is also a marvelous spot for taking a picture. It’s fun to walk around and search for the other Kappa in the neighborhood. Along with the fine quality of the specialized shops geared toward professional chefs, it’s also worthy to note that many of them are closed on weekends and holidays. On Saturdays, 90% of them are closed while that rate is 30% on Sundays. Even on weekdays, most stores are only open from 9 a.m. to 5 p.m. Moreover, since there are few restaurants on Japan’s No. 1 kitchen goods street, it is better to head for either Ueno or Asakusa on foot if you really want to eat. The origins of the Sanja Festival lay with the Hinokuma brothers who discovered a statue of the Bodhisattva Kannon, the principal image of Senso-ji Temple, and the landlord who consecrated the statue and established the temple, Nakatomo Hajino. The three spirits of the men were then enshrined. The Hinokumas, who were fishermen, found the statue in the middle of a fishing net, and in 1312 when the festival was first started, it took on the form of a boat festival with mikoshi being placed on boats. And then with the separation movement of Shinto and Buddhism during the Meiji Era of the late 19th century, Senso-ji Temple and Asakusa Shrine were separated of their association, and the Sanja Festival was celebrated only for Asakusa Shrine. Before long, the festival developed so that the current style of pulling floats and mikoshi through the streets accompanied by shouts started after the Meiji Era. The mikoshi bearing the divine spirits are carried and pulled through the area, and the festival is an important one for the people of Asakusa as they pray for security and peace. The Sanja Festival takes place annually on the 3rd Friday, Saturday and Sunday of May. During those 3 days, the streets come alive with the passion of a festival and with many stalls being set up and lining the streets. On the eve of the festival, there is a solemn ceremony involving the transfer of the divine spirits to the mikoshi of Asakusa Shrine. On the first day, a full display of Japanese culture can be experienced as a parade of music and dance by performers in brilliant clothing, and offerings of dance at the main shrine building and Kagura Hall are performed. At this time, the Binzasara dance is performed for a good harvest, financial prosperity and prosperity for one’s descendants, and has been designated as an Intangible Cultural Property. The second day is the time when 100 mikoshi with their spirits are majestically brought out one by one. The mikoshi are pulled through the streets amid the enthusiasm of the people, and the area is engulfed in excitement. 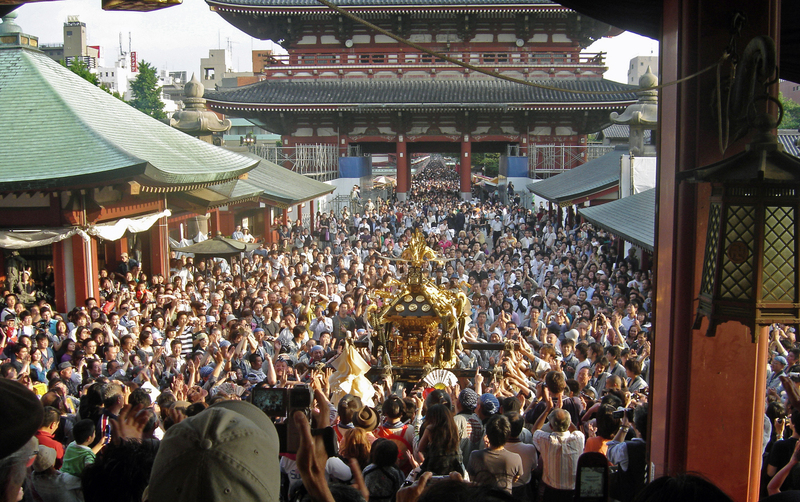 Then on the third day, the mikoshi of Asakusa Shrine are toured through the streets. They return to the shrine and then there is a solemn performance of dance and drumming as the festival ends with the ceremonial return of the divine spirits back to the shrine. There are 6 lines in operation. The pleasure boat, Atake Maru, used by the feudal lords of the Edo Era as a personal luxury passenger vessel, has been re-created. Among the 10 types of water bus, this one gets a lot of looks. It has a strong sense of entertainment, and the onboard meals and shows have an elegant atmosphere. Travel time is about 40 minutes. Also, there are a variety of events throughout the year such as a New Year’s cruise, a night cherry blossom-viewing cruise, cruises through Sumida River and Tokyo Bay to see firework festivals, a Christmas cruise, and a cruise to see Tokyo Sky Tree. There are 11 courses in operation from shitamachi areas such as Asakusa and Ryogoku to seaside areas like Odaiba and Kasai with their own elaborate details. There are tours such as “The One-Day Relaxing Tour” that goes through Tokyo Bay and the surrounding rivers in 8 hours and 50 minutes and “The Kawasemi Asakusa, Hamarikyu Tour” that goes to the Hama Detached Palace while viewing the bridges over Sumida River that has been called the museum of bridges. On “The Kawasemi Nihonbashi River and Kanda River Tour”, relics of Edo and the current Tokyocan be seen from ship. The width of the two rivers is narrow, so you can view both riverbanks from close up, a valuable experience that cannot usually be seen. The “Tokyo Canal Cruise” is a tour of Tokyo’s famous bridges starting and ending at Nihonbashi. You can get a 360-degree view of places such as the underside of bridges from an open ship without a roof. You can experience going through Ougibashi Lock known as “the ships’ elevator” for ships to traverse through canals of differing water levels. Since there is no roof, you can enjoy the bridges passing over your heads one by one.